SORROW over sometimes rancorous divisions, a growing sense of shared history and faith, and a commitment to reclaim a heritage of unity. These words might describe any Christians seeking reconciliation with brothers and sisters around the communion table. And that was the point. Yet by the twentieth century, divisions had taken root in this movement founded on unity. Differing approaches to Scripture led to different practices of worship and church structure. Mutual accusations of unfaithfulness resulted. Each stream took its views around the world. There had always been some communication. 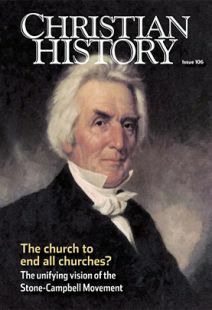 But by the late twentieth century, church leaders began new efforts to reconnect these estranged sisters and brothers: the Restoration Forums (1984–2007) and the Stone-Campbell Dialogue (1999–present). Scholars col-laborated to produce new stories of the entire movement’s history. One hundred years earlier in 1909, the Disciples of Christ had commemorated the centennial of Campbell’s words with a communion service at Forbes Field in Pittsburgh during its annual convention. Now leaders from the separated streams decided to hold another communion service—this time including Christians from all Stone-Campbell streams and beyond. Beginning in 2005, they produced resources for planning “Great Communion” services worldwide—not simply as a nostalgic remembrance, but as an active re-appropriation of Thomas Campbell’s passion for unity in the twenty-first century. Organizers released the book One Church, restating the Declaration’s main propositions in contemporary language and issuing calls for unity in the spirit of Thomas Campbell. People from Stone-Campbell churches around the world contributed to its writing. On October 4, 2009—World Communion Sunday—hundreds of churches in the United States and 87 other countries celebrated the Great Communion. In many instances, Christians from other traditions were invited to participate, signaling the intent of Thomas Campbell’s original appeal. New relationships were forged, not only among the streams, but beyond them as well.